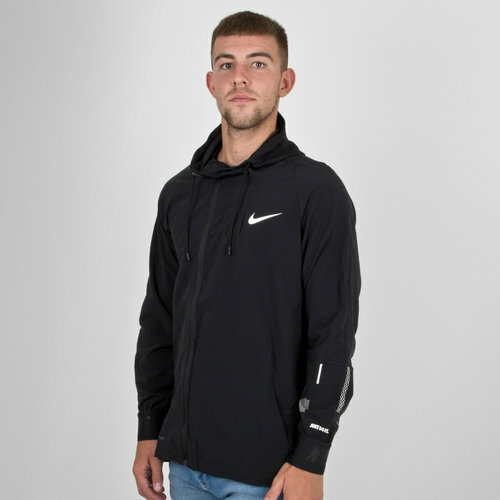 when training you need to be able to move freely so look no further than this Flex Training Jacket in Black and White from Nike. This jacket stretches with your body as you move, helping you get the most out of your workout. The flex jacket fabric stretches in all directions to let you flex those muscles without any restrictions. With vents at the sides to also help you move freely this jacket is comfortable and warm. The scuba hood helps to keep you warm whilst you train outdoors with the Dri-FIT technology wicking sweat away from the skin to help keep the wearer dry. Panels 88% polyester & 12% spandex.